The Rack Track depicts Death as a skeleton riding a white horse, galloping clockwise around an elliptical track. The fence surrounding the track is broken; pacing the horseman on our side of the fence is a large, undulating snake. One dead tree and a building on the horizon are the only points of stability in a composition based on motion. The story inspiring the work was recounted by Henry McBride in 1917: Ryder befriended a waiter at his brother's hotel, and when talk turned to racing Ryder tried to discourage the waiter from gambling on horse races. The locally famous Dwyer brothers were boasting about their talented colt, Hanover, and in May entered him in the Brooklyn Handicap. Ryder's friend bet his life savings of five hundred dollars on the horse to win; when Hanover came in third, the waiter committed suicide in despair. Distressed, Ryder wrote, "This fact formed a cloud over my mind that I could not throw off, and 'The Race Track' is the result." The Race Track presents life as a horse race, in which the only constant competitor is Death. Critics have described Death as condemned to ride alone, having mown down all others, or as a symbol of jockeys and horses killed in racing spills. The elliptical track has been seen as representing the inevitability of fate. The connection between Death and the snake, however, has often been overlooked. Since biblical times the snake has been used to represent evil and the power of temptation, here moving on a separate but parallel course with Death. The apocalyptic vision, common since the Middle Ages, often relies on the depiction of Death mounted on a pale horse, wielding a scythe. Frank Jewett Mather, Jr., suggested that Ryder''s depiction of Death derives from Pieter Bruegel the Elder's Triumph of Death, ca. 1564 (Prado Museum, Madrid). Ryder visited Spain on his tour of Europe in 1882 and could have seen this painting as well as other depictions of this theme; given the changes apparent in the X-ray [of Ryder's painting], however, Ryder's initial concept did not owe the same debt to Bruegel as the current incarnation. 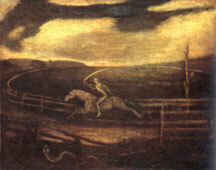 Death as a horseman was a popular image in American painting as well, finding expression in works such as Benjamin West's Death on a Pale Horse and John Quidor's Ichabod Crane Pursued by the Headless Horseman; in England, Turner gave it a particularly haunting power in a sketch now hanging in the Tate. Perhaps as significant as all of this for Ryder was the death of his long-time friend Olin Warner in 1896, the year that the painting is first mentioned, from injuries following an accident in Central Park when his bicycle collided with a horse-drawn cab. Letters to Warner's widow and daughters reveal the depth of Ryder's feelings. Ryder's mother died the same year and his brother William in 1898; Daniel Cottier [an influential art dealer, friend and mentor] had died in 1891. Death must have weighed heavily on Ryder's mind during this decade. In this light, Ryder's story of the horse race provides an understandable deflection of attention from personal tragedy to contemplation of death in general.